- Maple season is upon us, be sure to get your syrup orders in! -Foals will be arriving shortly! We have a few nice horses available for sale currently! Welcome! Our farm is located in Jasper, ON just minutes from Smiths Falls and 40 minutes from Ottawa. Christmas tree sales The last weekend of November! We have 95 acres of 'cut your own trees' and have pre-cuts available as well. Maple Syrup is available in limited quantities. Be sure to get your pre-orders in for the spring to guarantee you will get your order. Foundation bred Morgan Horse we have a couple of 2018 foals available for sale as well as a couple other Morgans available! Please check out our Blitzen Morgans link for more information on our horses. We offer Trick Horse Training clinics, lessons and demonstrations with our Morgan horses. Please check out the Horseplay and Harmony link for more details. We are excited to be part of this wonderful community! We have both pre-cut and 'cut your own' Christmas trees available for sale from the last week in November through to Dec 24th. 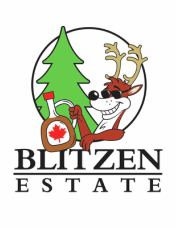 ​We offer maple syrup for sale in various quantities. Be sure to pre-order for 2016 sales, once its gone its gone! Raising and Training Founration Morgan horses.